This week I am teaming up with some amazing bloggers brining you a series of Schools out: Top 10 Summer posts! You can check out the links at the bottom of this post for more information! Toddler’s learn language all day, every day from their morning diaper changes to breakfast, to play time, to book reading to bath time. 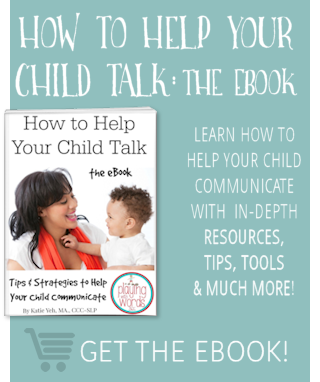 Whether your child is struggling with speech and language development or not, it is important to provide your child with new, novel, rich experiences in their life. Though children learn their basic speech and language skills during everyday routines, exposure to new and fun activities help provide your child with exposure to new vocabulary, concepts, play schemes, and provide them with opportunities to ask and answer new questions about their world. Today, I challenge you to try 10 new activities with your child this summer! Summer vacation (or just “summertime” for those of you who don’t really have a break) is about 10 weeks long (give or take) so in my challenge, I am only asking you to try one new activity a week. You can do that, right? I KNOW you can! I am going to share 10 types of engaging activities you can try with your child. Ready? Let’s get started! 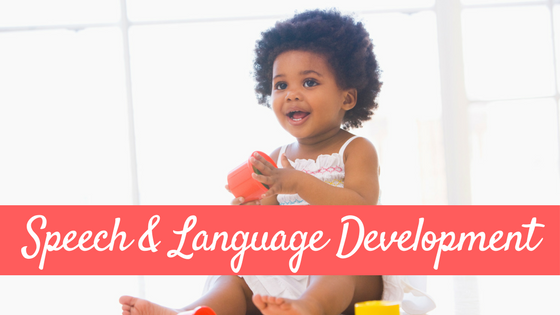 Five Tips to Help Your Toddler Learn Language and Communicate. This is a guest post I did at one of my favorite blogs Toddler Approved several months ago. 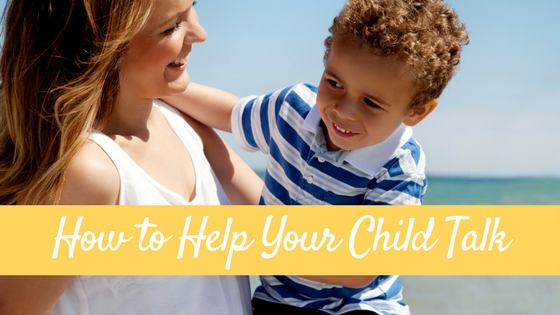 I provide my top 5 tips for helping your child learn language and communicate. Use these 5 tools in your tool box when playing with your child to help expand his/her speech, language and communication skills! 10 Ways to Practice Waiting. In my post linked above, I talk about the importance of WAITING. Kim at Little Stories has a fantastic post about this. GO check it out and use her tips this summer. Questions: Why Less is More: Part ONE and Part TWO: In my two posts, I explain the importance of not asking too many questions while interacting with your young children and give tips on how to use questions minimally but effectively. Make sure to read Part One and Part Two and think about your language as you play with your child this summer. I Hold, You Talk. This is a strategy I use all the time with my little client’s who are working on those first words and phrases. Kim at Little Stories coined this great term and explains it on her blog. Another great tool to add to your toolbox. Expansions and Extensions: I am constantly using these with my own toddler. These are great for your children who have just started talking all the way up to children speaking in short sentences. A must have in your toolbox for this summer. 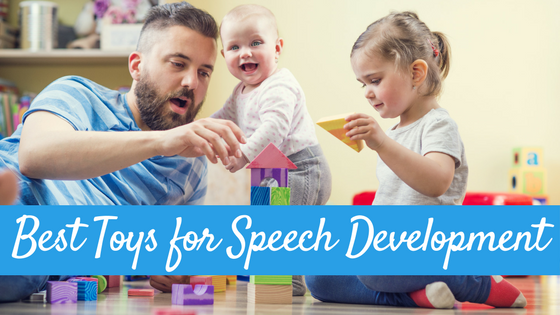 Now that you have gathered all your tools for helping expand and extend your child’s speech and language skills, it is time to put them in use in NEW activities with your little ones! 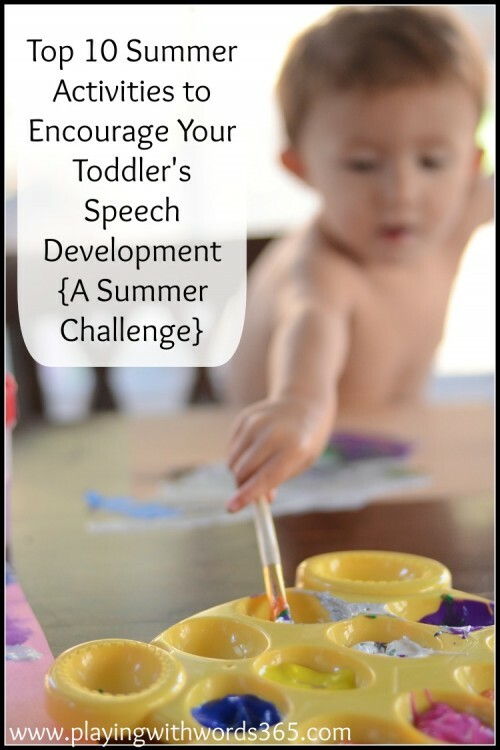 Here are my Top 10 Summer Activities to Encourage your Toddler’s Speech Development. In reality, I am sharing 10 CATEGORIES of play activities, with links to several different individual activities. See if you can pick one from each category and try it this summer with your child! 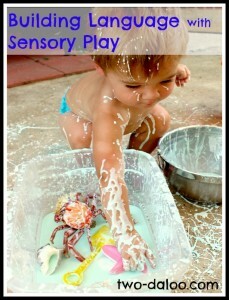 What is Sensory Play? Sensory Play/sensory bins are a GREAT way to work on speech and language skills with young children. Stephanie, a fellow SLP and mother to boy/girl twin toddlers, wrote a fantastic post recently on this topic on her blog Two-Daloo. Click on the image below to take you to her post, where she explains the benefits of sensory play! It is summer. It gets hot. What better way to kill a few hours than playing in the water? There are SO many different ways to play with water this summer. 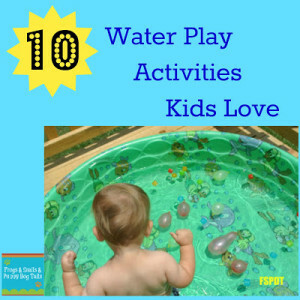 Click on the images below to take you to two great posts with tons of water play ideas. Pick something NEW and have FUN! Jamie from Frogs & Snails & Puppy Dog Tails put together a fantastic roundup with 10 great activity ideas. Yup, more water activities for you! These are a little different than the activity ideas above, however. These activities can be done in your bathtub and some can be done in an outdoor pool. Themed pool/bath activities are a great way for you to incorporate fun new vocabulary while having fun. Crystal from Growing A Jeweled Rose has this great roundup of 15 Super Fun Bath Activities. 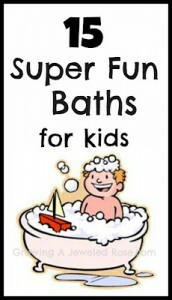 If you are looking for more check out her other blog Bath Activities for Kids. 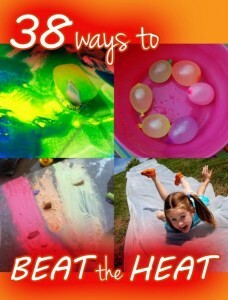 I’ve already given you a ton of ideas to incorporate water in your play this summer, but you can also do a LOT with ice! I shared this post above…click the image and scroll down to the bottom for several ice play ideas from hands on:as we grow. I have written about obstacle courses before. I LOVE using them in therapy as well as with my own children to work on speech, language, and motor skills. You can read that post HERE with my tips on using obstacle courses to work on speech and language skills. I talked about how awesome Hide and Seek is for speech and language skills in my post Five Playful Ways to Expand Your Toddler’s Vocabulary While Outdoors. Check out tat post for some tips on playing with your child and how to target vocabulary. Also, I LOVE this post by How to Run a Home Daycare where she shares three different ways to play Hide and Seek. So fun! What Does it mean to act out or play stories? This simply refers to doing a play based activity revolving around a favorite book. 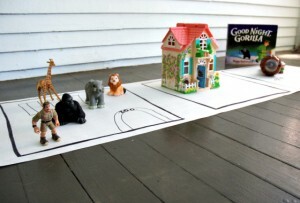 Kim, my friend and fellow SLP from Little Stories shared how she uses Story Squares to play stories and work on storytelling skills with toddlers and preschoolers as a guest post on Classic Play. Though this is a year round activity, you can easily make it more “summer based” by choosing books that have summer or outdoor play themes! 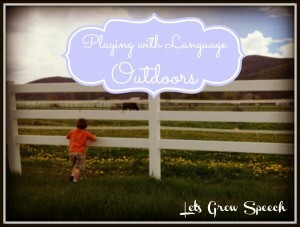 In fact, Katie, another fellow SLP recently shared how she uses books outdoors in her post Playing with Language: Outdoor Play. Click on the images below to take you to Kim and Katie’s posts for inspiration! 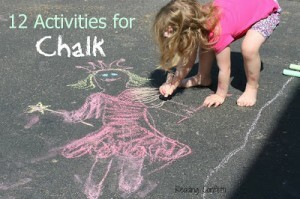 Chalk is a pretty inexpensive and fun outdoor activity that can provide hours of fun your child! 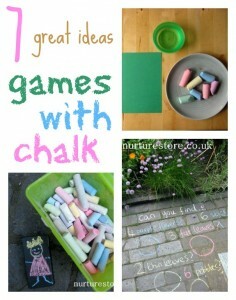 Here are two great round ups that provide you with more chalk activities you could try out this summer! Not everyone is crafty. And, not every toddler is into crafts either. BUT…arts and crafts are fantastic opportunities to work on speech and language. In fact, Stephanie from Twodaloo has a great post ALL about this, which includes some simple craft ideas. Click on the image below to check it out. 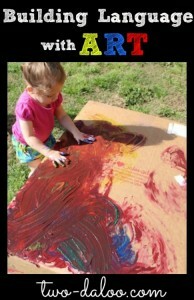 Looking for more simple toddler art/craft ideas? Rainy Day Mum shares a few in her post below. So this last one is simple: Get out of the house and go somewhere NEW. Been planning on going to that new play place? GO! Have a zoo near by you haven’t hit up yet? GO! Get out of the house and do something NEW with your child. Here are some ideas off the top of my head. OK so there you have it. 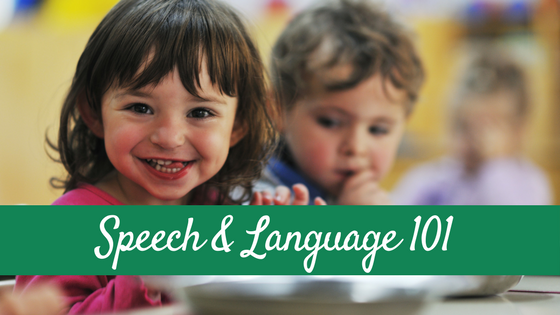 My top 10 activities for this summer to help expand your child’s speech and language skills. Remember…just the act of DOING the activities can help expose your child to new vocabulary and experiences. Add the use of the tools we talked about above, and you have a great recipe for success! Tell me, what activities would YOU like to try with your toddler this summer? 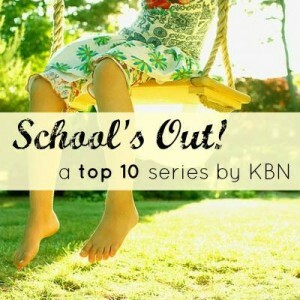 Time to go check out all the other amazing Top 10 Summer posts from these fabulous bloggers. Emma @sciencesparks recently posted..How old is a tree? What a great list! I’ve pinned this to my parent resource board! 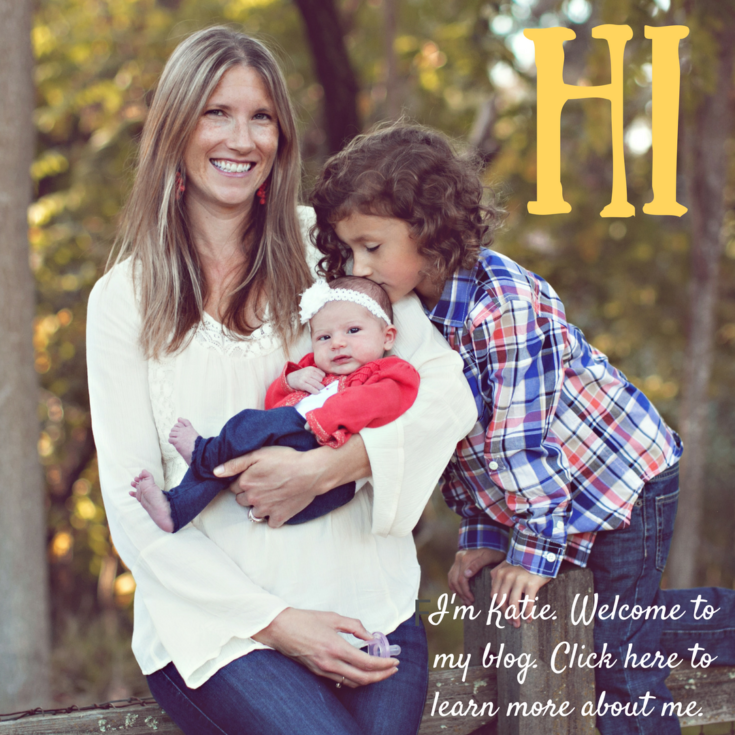 Wow, Katie, this is such a fantastic resource for parents! Thanks so much for including my posts- I hope they can help inspire parents to try some new activities with their toddlers! I will be sharing this throughout the week next week on my social media. Excellent list. We shared it on our FB page. I will add this on my list, my kids would love that.